‘tern’ is a fine weight yarn from Quinco & Co. that consists of 75% American Wool and 25% Silk, and ‘tern’ is my favorite fine weight yarn for the moment. 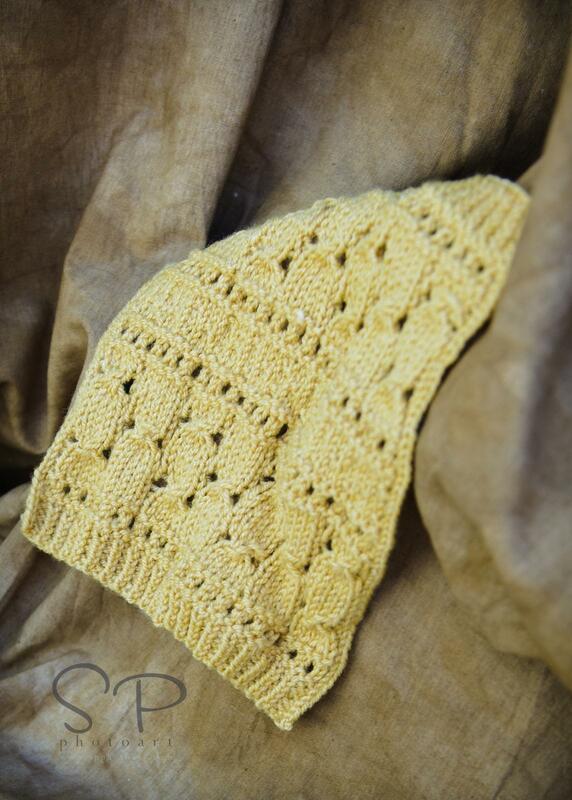 ‘tern’ comes in 12 colors and I love the subtleness of the each color… and to me the best part of this yarn is how easy it is to work with and the way it showcases different stitches. I leave you now with a couple swatches that I made with ‘tern’ and a little preview on what’s coming for my Accessory Collection 2011 that hopefully will be available by this Fall. So what projects will I be using these swatches? Gloves? Socks? Cowl? Hat? I would love to keep it a secret for now. A big ‘Thank You’ to Suzanne from SP Photoart for taking the pictures. Photograph by: Karen K. Modeled by: Silka B. Let me introduce my new gloves design – Misty. 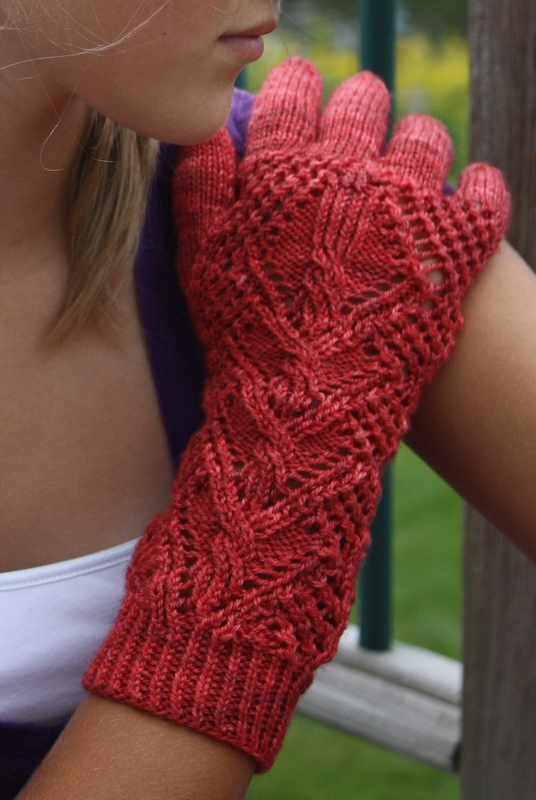 I love lace gloves that work in skinny yarn in the winter. I want to keep my hands warm but not feeling bulky at the same time. I also wanted a pair of gloves that can dress up to go to a formal event or down to have a stroll in the park. 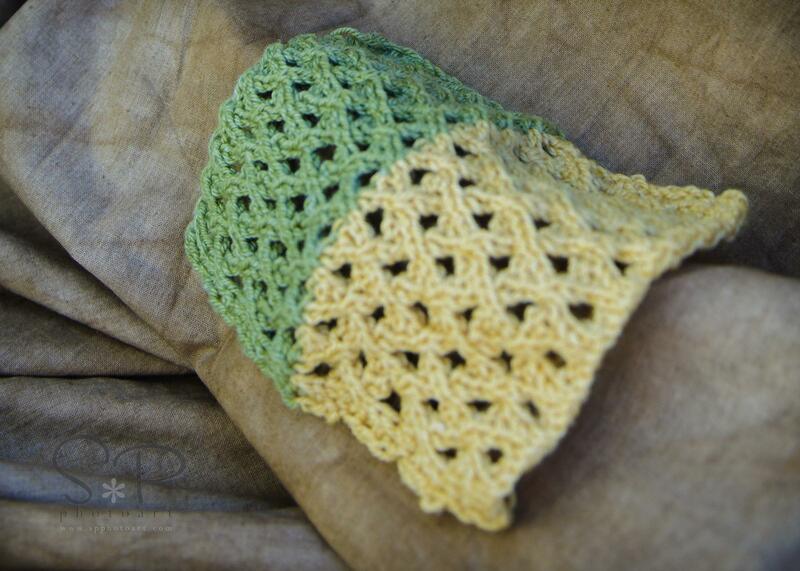 Therefore, I decided to choose a very lace motif and pair the design with a unique yarn that made from merino wool and milk fiber. The name ‘Misty’ came to me because of the color of the yarn. ‘Blue Notes’ is the name of the color and was hand-dyed and spinned by my friend Lindsey who is the owner of Waterloo Wools. This blue/grey/tan color combination remained me of the cloudy and misty sky in the winter. 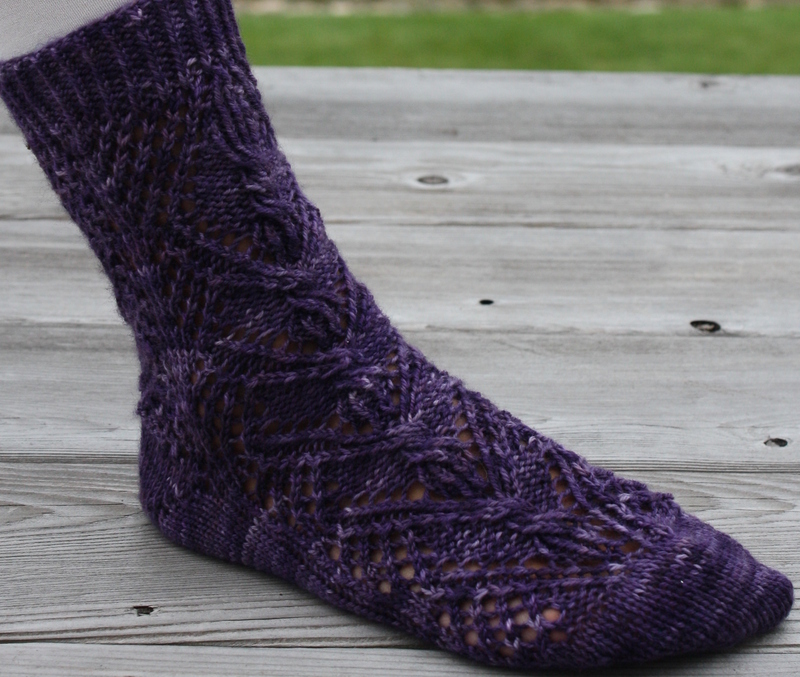 NOTE: Substitute Bayfield with any sock yarn that maintains the same gauge. PATTERN NOTES1. The pattern of Misty is written in the assumption of using magic loop method. Hence, the pattern will refer sts in 2 groups – group 1 and 2. 2. Although Misty can be work using the dpn, but since the nature of the lace panel, magic loop method will be the preferred method. 3. Both left and right hand gloves are worked the same way; hence, only 1 instruction is given. 4. When working on thumb increase, always increase at the beginning on group 1 and the end on group 2. Refer to Chart 2 for group 1 sts and chart 3 for group 2 sts. 5. Always work the increase sts in purl. 6. Because each individual’s fingers are unique, so measures each fingers before working on the gloves. The pattern pdf includes detailed written instruction, magic loop tutorial and detail supporting charts for the lace panel and thumb shaping. Just want to announce that the patterns for Victoria Gloves, Victoria Socks and Bonnie Mitts are available through my site, Ravelry and my etsy store. Simple go to my pattern link and click on the image for more information. I have also put Victoria Gloves and Socks as a set in a discounted price. As always, if you have any questions regarding the patterns. Please feel free to contact me! As I have finished my urgent project commitment and have a little bit of time (a week to be exact) before next rounds of design submissions. I decided to start working on my first Winter Accessory Collection that I would like to be completed by fall. I am very excited to introduce ‘Victoria’ – A lace gloves and socks design features two of the Waterloo Wools; a fingerweight yarn composes of 50% merino Wool and 50% Tencel for the gloves and merino and nylon for the sock. I wanted my 1st accessory collection to be driven by someone I know and I care about. For ‘Victoria’, I got the design inspiration from my sister, Vicky. Vicky lives in beautiful vancouver, Canada. She is a free spirit and fun loving person, a caring and a compassionate friend; a person who might look tough on the outside and often time not so easy to deal with; a stubborn person but with a delicate heart. We don’t see each other often, but I know she is always there for me when I needed her. I could not ask for a better sister. A lot of people might not think an overall lace motif will represent Vicky; but we just need to look through her outer appeal and look inside; then you will see how soft and delicate Vicky is. The tightly twisted cable inside the lace representing the tie between us. To my dear sister Vicky, I wrote this post on your birthday.. however, I wanted to have the pictures to come with it.. so this post is a little bit late… anyhow, this post is delicated to you by your also very stubborn little sister even though I might look more mature then you and have 3 kids.. but I am still your little sister. Cheers! After a long wait, my lace and twist cable gloves and socks patterns are available in the Interweave Holiday issue which is available in the newstand near you. I am very happy with the pictures of the projects. I have attached the pictures in this post. Both of the projects are worked using sock yarn in size 1 needle and they were worked using magic loop method. Want to know more about magic loop, please refer to my earlier posting. As always, I welcome any comments and if you have any questions about the patterns. Please feel free to contact me! 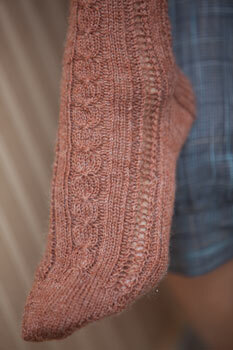 Also, please do drop by Ravelry to check out my other designs!